Well now, if Deez Nuts is polling 9% which is ahead of every Republican but Trump … mebbe one of those current also-rans ought to think about offering Deez Nuts the Vice Presidential nomination. After all, if McCain could dice-throw it with Sister Palin, why not try this time with this Nuts person? 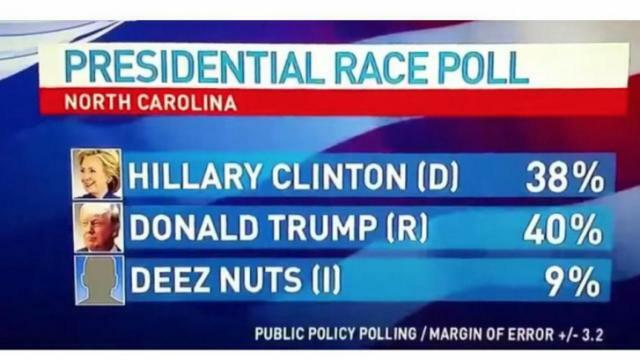 This entry was posted in campaigns, election, polls and tagged campaign, candidates, Deez Nuts by Arthur Ruger. Bookmark the permalink.